I am sometimes surprised when a particular blog post seems to resonate more powerfully than readers, but usually not. Here’s what I’ve noticed: the more personal I am, the more I push to be vulnerable and authentic, the more I self-disclose, the more likely I am to connect with my readers effectively. It’s true across social platforms: Facebook, Twitter, blogs. 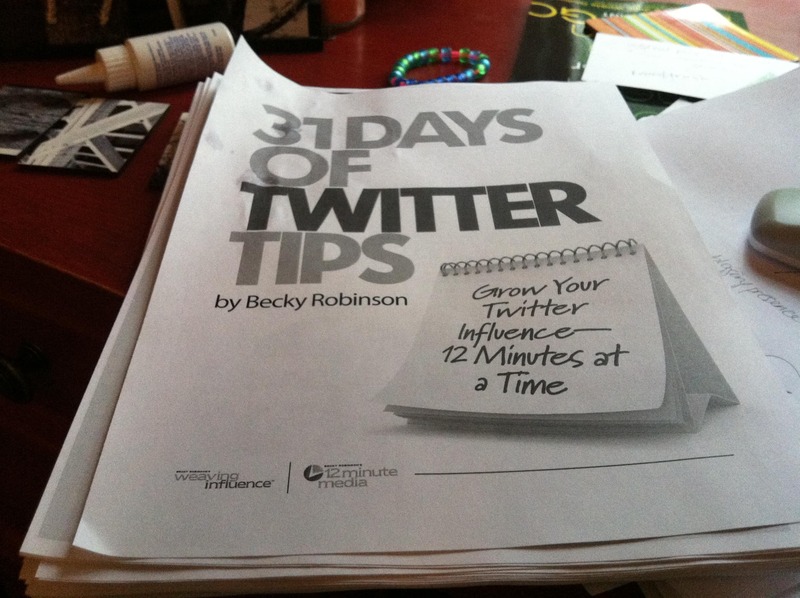 Last week I posted a photo of a printed copy of my Twitter tips e-book on Facebook. I snapped the photo without cleaning up the clutter on my desk. But the top sheet of the book, wrinkled by rain, clearly displayed my name. When I tweet something particularly meaningful to me — especially heartfelt follow Friday notes — people notice. People like and respond to personal. Commonly attributed to Carl Rogers, the words are proven true by my experiences using social media. Personal resonates. Personal inspires. Personal works because it is universal. Except a word of caution: be aware of your motivation. If you are using personal to collect page views and likes, you are missing the point. Be personal because it makes a difference. Be personal to make a connection. Consider the two quotes above today as you seek to connect with others through social media. Perhaps you want to be personal in a blog post. If so, set your timer for 12 minutes and be personal as you write a 12 minute post. Or bring personal to a Facebook photo or series of tweets. Share your life with others. Tell me something! Do you find it easy or difficult to share who you are online? What have you observed about how people respond to personal? Being,more open about feelings can either allow people to connect better or it can destroy the meaning of your work being display to the public.Some,people whether for you to express your talent&build off ability to use book smarts to get the job done.Or,shall we call it savvy computer skills&wisdom.Then,theres other people who are very mature&wise,but are still learning to understand other people ways of talking&how the present themselves. I enjoy being personal, but I still make an effort to carefully curate what I share online. I do not blog annonymously and write as if my parents, pastor, siblings, boss, etc… are reading my blog (many of them do!). I completely agree – be personal, but careful in what you share. Thanks for taking the time to comment. Being personal isn’t too hard… but sometimes *how* to share the personal is difficult to know. What to emphasize. What to leave out, because it really wouldn’t benefit anyone. I’m thinking of writing about my journey into chronic illness, and that’s what I keep struggling with. I don’t mind sharing it, but *how* should I share it? That is a hard question to answer, Elizabeth. You may have to experiment to find the right way to approach it. See what people respond to, see what feels comfortable. So what keeps people from being “real” – authentic, vulnerable? Sometimes it’s fear…Fear of not being liked for who we are. And sometimes I believe it’s just a choice. I believe some want to reserve the “real-them” for their close friends. A gift to be shared with the few, not the many. That can also be a beautiful thing. For me though, personal and imperfect, I suppose, is part of my “brand.” I have grown to love my gifts and appreciate my challenges too. I will continue to share them with the world, because, in my experience, sharing my failings (unexpectedly) has brought me some of my richest relationships. Thanks for the reminder about how important it is to be real and personal. Yes, people connect best when we let down our guard and share our personal selves. I have found that when I write a post that includes a personal story, like you, it seems to resonate more. Especially, if it’s about my dog!